Prayer, it’s an important and ongoing dialog with God that helps us grow closer to Him! Today on the Lighthouse Report, Max Lucado shares what he’s discovered about prayer. Doubts … we all experience them at one time or another. Well, today on the Lighthouse Report, Joanna Weaver shares a story of a girl in her church who overcame her personal doubts. God loves us and cares for us, no matter what! For Maralee McKee that was a hard truth to grasp because of experiences in her childhood. On today’s Lighthouse Report, she explains. When Lauren Daigle thought of her future, music was a big question mark. But after a stint on American Idol, God made His plans known to her. Today on the Lighthouse Report, Lauren shares her journey. You know, in the busyness of life, sometimes it’s hard to see the “big picture.” So, how can you stay focused on what’s most important? Casey Sollock explains on today's Lighthouse Report. Do you ever find it difficult to share your faith? Well, according to Tyler, it’s really not as difficult as it might seem. He explains today on the Lighthouse Report. “Empty Promises?” According to Pastor Pete Wilson, life is full of them. On today’s Lighthouse Report, he elaborates. The Christmas card that Laura keeps on her desk all year long is a reminder that Jesus Christ truly does transform lives. Host Steve Douglass gives the details on today's Lighthouse Report. Former US Army ranger Jeff Strueker fought in the “Battle of Mogadishu.” And it was during this time that God called him into ministry.Jeff shares his experience today on the Lighthouse Report. No matter what you might be going through this Christmas season, there is Light at the end of the tunnel. Kara Powell recalls a particular season in her life on today’s Lighthouse Report. For Sara Hagerty, her relationship with God grew deeper once she realized that He’s always there, no matter what. Today on the Lighthouse Report, Sara shares the details. You know, providing people with life essentials often opens the door to share God’s love! Mark Gaither, of the Global Aid Network, explains on today's Lighthouse Report. It’s amazing the way God works in our lives. Joey Lankford says he has seen God work in his life and in his family in powerful ways. Listen as he shares how on today's Lighthouse Report,. Boldness …. It’s a great attribute to have when it comes to sharing Christ! Judy Salisbury is our guest on today’s Lighthouse Report. You know, for God, nothing is impossible. On today’s Lighthouse Report, Steve Douglass gives some biblical examples and reminds us of how God can work in our life situations this Christmas. Praying, caring, and sharing Jesus Christ... those actions are the greatest gifts you can give to others. And on today's Lighthouse Report, Steve Douglass shares how we can make it forever Christmas when we do! Just what is your focus in life? Is it to help others? On today's Lighthouse Report, Wayne Hastings says that when you start to focus on other people’s needs, joy is often a result. Choosing joy? You know, sometimes that can be difficult. Today on the Lighthouse Report, Bernadette Todd, who’s confined to a wheelchair, speaks about her own challenges. You are made new … in Christ! What a great truth to remember this New Year! Singer Matthew West shares that truth often, both onstage, and one-on-one. He’s our guest on today’s Lighthouse Report. So … where do you look to find your security? On today’s Lighthouse Report, Dee Brestin shares how a woman named Rachel went from trying to create the perfect family, to loving them like God loves His children. Sometimes we’re asked spiritual questions that are difficult to answer. On today’s Lighthouse Report, Daniel Darling talks about ways we can respond. Connecting with immigrant families in your community … it can be difficult sometimes, can’t it? On today’s Lighthouse Report, expert Kate McCord gives her insight. Providing care and comfort for people isn’t always easy, but it’s something we’re called to do... especially at Christmas-time! 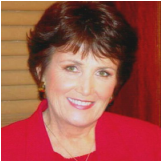 Today on the Lighthouse Report, Julie Ziglar Norman shares from personal experience.